From Mahabharata itself it is made evident that Vyasa created the seed of this epic and called it Jaya containing a few (8,000) verses. It was structured as a dialog between the Kuru king Dhritarashtra and his companion and minister Sanjaya. Sanjaya in this dialog narrates the Kurukshetra War as it happened in the battlefield of Kurukshetra between Dhritarashtra's sons known as the Kauravas and Dhritarashtra's brother Pandu's sons known as the Pandavas. The name Jaya meant victory in Sanskrit. This then grew into 24,000 verses and began to be called Bharata (read as Bhaarata). This was structured as a dialog between Vyasa's disciple Vaisampayana and Kuru king Janamejaya. Janamejaya was in the fourth generation of Dhritarashtra. (Dhritarashtra's brother Pandu > Arjuna > Abhimanyu > Parikshit > Janamejaya). Thus it is clear that four generations of contributers added their contribution to the epic when it became structured thus. In this dialog between Vaisampayana and Janamejaya, one can find that the original dialog between Sanjaya and Dhritarashtra as embedded inside. Thus Jaya is embedded within Bharata. The name Bhaarata meant the offspring of the great king Bharata, or the history of the kings in the line of the great king Bharata. Finally the epic takes the shape of a dialog between Ugrasrava Sauti and sage Saunaka. In this stage, there are more than 100,000 verses in the epic and it became referred to as the Mahabharata. Mahaabhaarata meant the great history of (kings in the lineage of) the great king Bharata. How many generations has passed between Vaisampayana and Ugrasrava Sauti or between Janamejaya and Saunaka is not known. Though Ugrasrava Sauti claims to be a colleague of Vaisampayana and Mahabharata portrays both being the disciple of Vyasa, learning from him the verses of Mahabharata, it is possible that this Vyasa who instructed Ugrasrava Sauti could be a sage in the lineage of the Vyasa who authored the Jaya. Also it is impossible for the same Vyasa to be alive for five generations. Immortality of Vyasa is a myth, which can be best explained as several generations of Vyasa's (who could be in the lineage of the original Vyasa or in the lineages of his disciples), carrying his activities forward through generation. Interestingly, the dialog between Vaisampayana and Janamejaya is embedded within this dialog between Sauti and Saunaka. Thus Bharaata is embedded in Mahaabhaarata. Currently we get to read this epic as a narration by an unknown narrator who narrates the dialog between Ugrasrava Sauti and Saunaka, in third person. It is also unknown how many generations had passed since the life of Ugrasrava Sauti and this unknown narrator. Mahabharata has a geographical meaning. [[[Emperor Bharata]]'s territories extended to the whole of Indi-Gangatic plane. He indirectly controlled the land as far south as Kumari (Kanyakumari). Through his sons and descendants, Emperor Bharata's territory encompassed the whole of modern-day India and hence was known as the Bharatavarsha. The name Mahabharata is synonymous with Bharatavarsha. Mahabharata has a political meaning too. Politically it denotes the whole nation. 'Bhaarata' can be described as the 'Empire of Bharata'. 'Mahabharata' can be described as the 'Great Empire of Bharata'. In describing the circuitous pilgrimage journeys of Arjuna and later Yudhisthira and in describing the journeys of Yudhisthira's brothers into four cardinal directions for Rajasuya, Vyasa has united the East, South, West and North of India. Truly, Vyasa's Mahabharata is the soul of India (Bharatavarsha)! In it lies the sacred thread that unifies the whole of India. Vyasa together with Valmiki are the forefathers of Bharatavarsha; emperor Bharata is its founder. 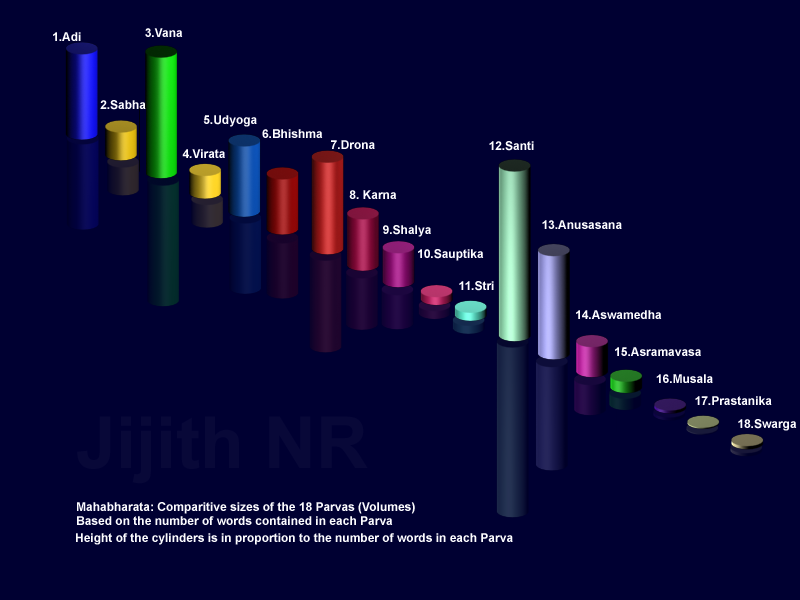 The image below is a comparison of the 18 volumes or Parvas of Mahabharata bases on the number of verses contained in each of these Parvas (Books). 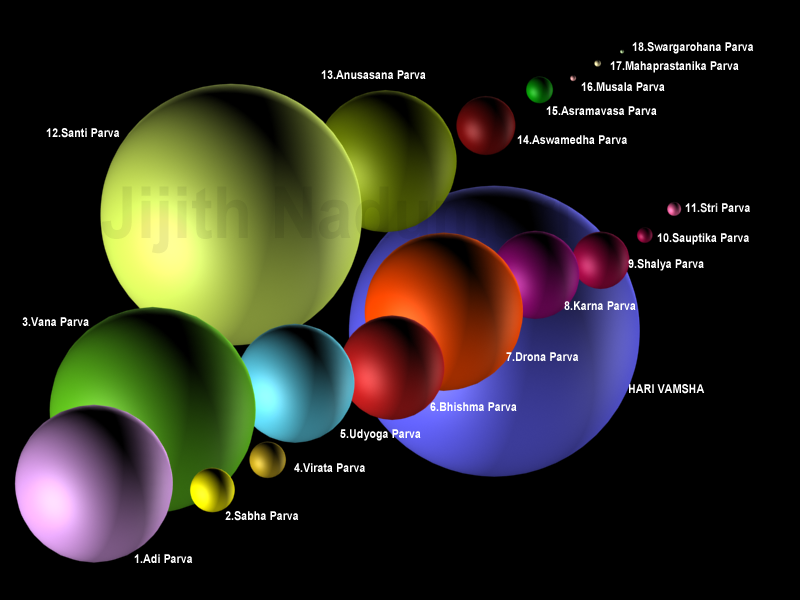 The radius of spheres are in proportion to the number of verses contained in each Parva. the appendix of Mahaabharata, viz. Harivamsha containing three more Parvas (Harivamsha Parva, Vishnu Parva and Bhavishya Parva) within it is shown in the background. Below is a comparison of the relative sizes of the 18 volumes of Mahabharata in the form of cylinders. The number of words (in the English translation) are compared here. The words are in proportion to the heights of the cylinders. Below is another comparison of the 18 volumes of Mahabharata. The number of words (iin the English translation) are compared here. The words are in proportion to the volumes (not radius) of the spheres. Santi Parva is the largest volume or book of Mahabharata, due to its continuous growth by addition of verses, for centuries. Vana Parva, Adi Parva, Anusasana Parva and Drona Parva too contains later additions. Bhagavat Gita of Bhishma Parva too seems to contain some later additions. Musala Parva was the last Parva added as Sauti narrated Mahabharata to Saunaka. Maha-prasthanika and Swarg-arohana Parvas seems to be later additions. Below is the table of verses contained in each of the 18 Parvas (Books) of Mahabharata. 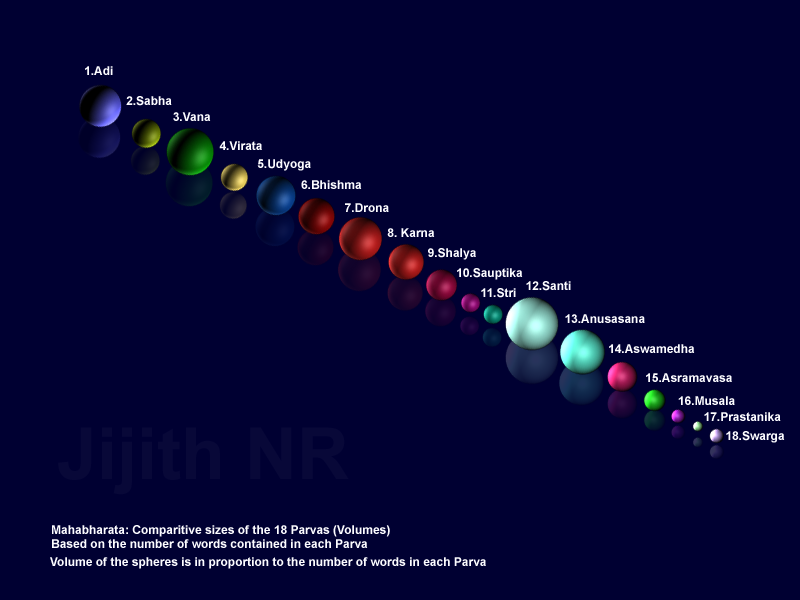 Mahabharata (Sauti Era) shows the number of verses in each Parva as narrated by narrator Sauti himself in one of the chapters of Mahabharata (Mbh.1.2: Parva Sangraha). Sauti probably lived between 500 to 1000 years after the core event of Mahabharata viz. the Kurukshetra War. There is a possibility that this account is added or edited later by somebody on behalf of Sauti. Mahabharata (15th century) is bases on the accounts of 15th century translators who translated Mahabharata to Persian language. Harivamsha is an appendix of Mahabharata. It deals with the history of Krishna and his (Yadu) lineage. Worship of Krishna as a great teacher of philosophy probably originated during the life time of Krishna himself. Many contemporaries like Vyasa, Uddhava, Vidura, Yudhisthira and Arjuna had recognized the significance of his teachings and the strength of his philosophy. From Mahabharata we learn that Vajra the grandson of Krishna was installed at Indraprastha along with Parikshit the grandson of Arjuna. These kings were devoted to Krishna and probably might have been instrumental in the promotion of Harivamsha and its addition to Mahabarata. Sauti mentions that Harivamsa contained 12000 verses and two Parvas viz. Harivamsha Parva and Bhavishya Parva. The 15th century translators found 16,374 verses in Harivamsha and three Parvas viz. Harivamsha Parva, Vishnu Parva and Bhavishya Parva. Hence we can conclude that Vishnu Parva was added after Sauti. There was also some growth to Bhavishya Parva. The two Puranas viz Vishnu Purana and Bhagavata Purana were inspired by Harivamsha and contains many verses, themes and concepts taken from Harivamsha. The rest of Mahabharata had not changed much in these times. Below is a table summarizing my analysis of Ganguli's English Translation of Mahabharata, available online. This analysis is done using a language-parsing software I developed named Parse. The analysis reveals that a reasonable rendering of Mahabharata in English, written originally in Sanskrit, will contain 2.4 million English words and more than hundred thousand English sentences.